Laporta behaviour at thetime of the flare up during the Espanyol match and after that talking to the press has been really awful. He should be shamed of the way he conducted especially during the match. It was clear from the start of the incident that it was started by some stupid Barcelona fans. 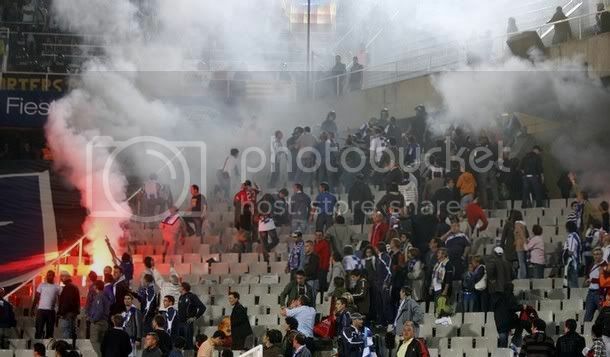 The reaction from Espanyol fans could be justified after most of them were scrabmling for safety. Yup, some of them did try to break into the pitch. MudnoDeportivo reports that half a dozen flares were thrown out by Barcelona supporters on to a section crowded by Espanyol supporters. 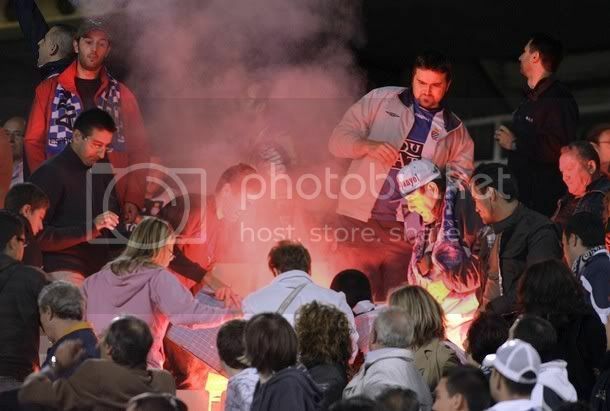 Most of the Espanyol supporters were running for safety and there were utter confusion around the stadium. In the box, Espanyol president and others did well to maintain their calmness during the course of events. But Laporta just went Berserk. No idea as of what promted him for such a action. But his behaviour was appaling. 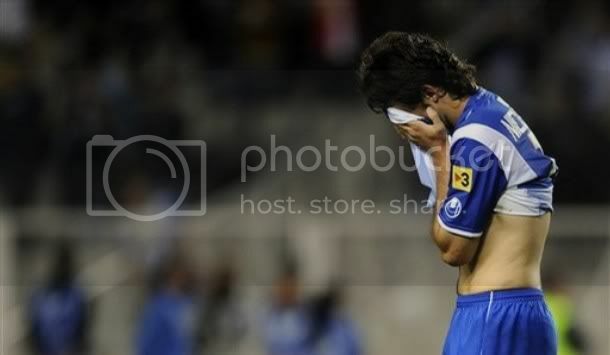 It was really commendable of the members of Espanyol club in the bo, that they did not respond to his accusations. If they had then the situations would have been worse. After the match Joan Laporta put the entire blame on the Espanyol club authorites. The section of the stadium from where the flares were thrown up were occupied by the infamous "Boix Nois" - the mad boys of catalan. 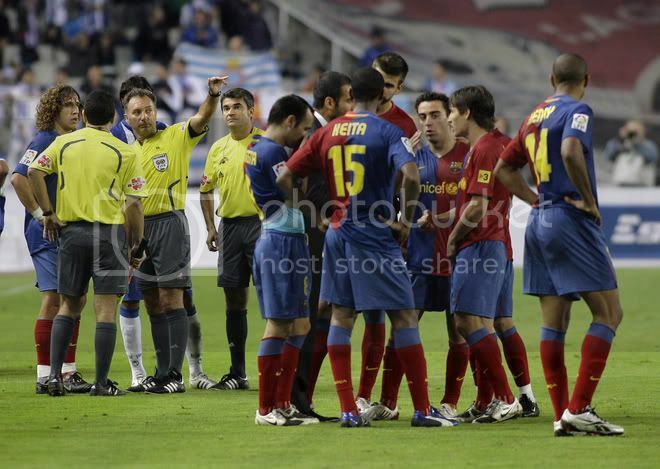 Joan Laporta said that Boix Nois were not allowed to enter to Camp Nou and it was Espanyol's fault to have let them in. But he never felt a sense of regret after all it was the supporters of Barcelona started this. There were reports from Sport.es suggesting that a lady almost suffered a nervous breakdown due to panic. 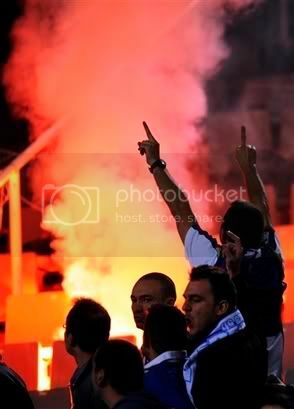 The Espanyol authorities has to side a huge reponsibility of blame as they allowed these fans to bring these flares. But this was not the time for Laporta to play politics. The image of the club has been tarnished and more sensible reaction should have been to pledge support to find and punish those who were reponsible. But Laporta after all may not be a Gentle Man as we all believe. Valdes - 6 - Had a pretty decent game apart from that blunder which resulted in the goal. He may be right to complain that he was fouled; but should have looked for the safest option rather than being stupid. Alves - 7 - Was good in parts especially going forward. But has not found that form which made him famous in Sevilla. Is combining well with Messi and could form a partnership like the one between Sylvinho and Ronnie. Puyol - 7- Was good for most part of the match. But cannot simply wash his hand off in not guarding his goal keeper in an incident which led to first goal. Pique - 6 - Was solid, made least mistakes but again wasn't sensational in any aspect. Had some decent headers from corners, couldn't convert any of them. 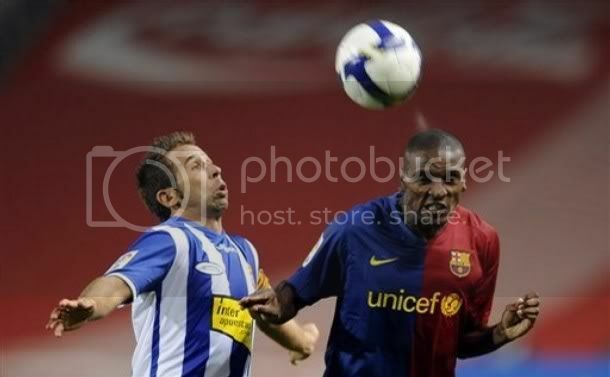 Abidal - 6 - Had a pretty good game compared to his recent matches. Didn't do anything special but also made least mistakes. Gudjonsen - 5 - Was rewarded with a start after a great last game. Could not make any impression. Was not linked to any of his team mates. Busquests - 7 - Had a decent game. Again was solid through out the match. But showed a pentant for over reactinga nd acting up in many occasions. Xavi - 7.5 - Was solid eventhough wasn't spectacular. Did well with the ball which resulted in first goal. Then had a shot hit the cross bar. Messi - 8 - Had made so many interesting run at defense. Wassn't able to deliver on the final ball. But was a menance constantly. Henry - 7 - Did well through out the match. Didn't do enough to replace Eto in future matches. Iniesta - 8 - Did well throughout the match. send some sensational passes and crosses but majority was wasted by his team mates. Eto - 7 - Did well after coming on. Was a constant threat with his positioning. Bojan - 5.5 - Wated the time given to him. Wasn't able to make any impact. Had many shots, none of the were near the goal. Keita - 6.5 - Didn';t have too much to do. Was avearge throughout. FC Barcelona finally halted Espanyol's undefeated run in the local derby with a last gasp controversial win. Has this result did any good to Barca's credential as a championship contender is still open to debate. But taking a cue from Madrid's last two season these scamble wins does more good to the confident of the team. 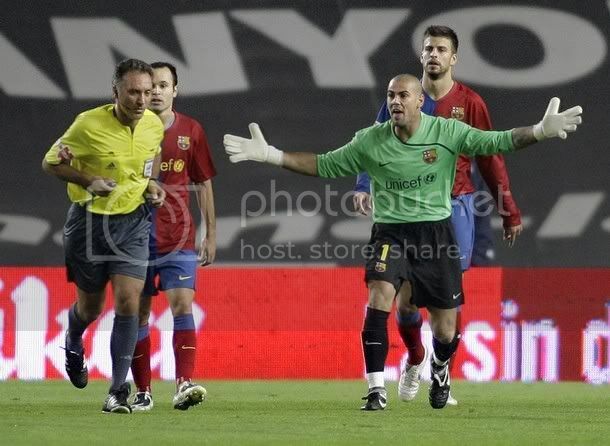 Against the run of play Barca went down to a stupid mistake by guess what who - Victor Valdes. 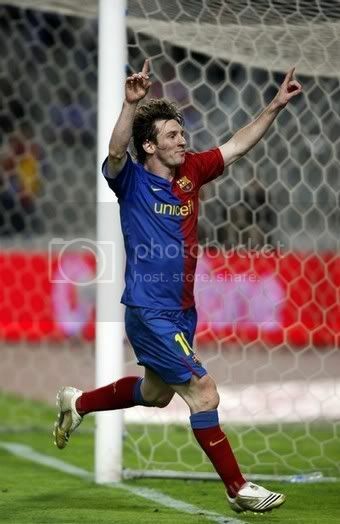 Henry equalised for Barca with a lot of luck and then Messi converted a penalty from the last kick of the game. FC Barcelona controlled the game from start to end but sloppy defending and one silly mistake from Valdes who otherwise had a decent night almost outdone FC Barcelona. Guardiola wen a bit further with his swuad rotation including Henry in place of Eto; Gudjonsen in the midfield. As expected Pique played in place of Marquez. 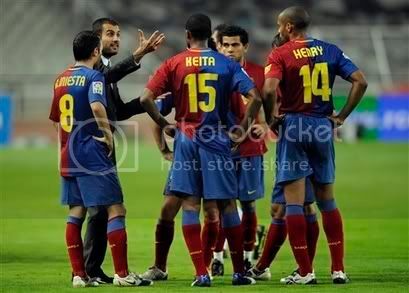 Pique, Puyol, Alves and Abidal formed the back four, In the mifield Busquests and Xavi formed partnership with Gudjonsen. Messi, Iniesta and Henry formed the front three. FC Barcelona started the night confidently. In the 10th minute Iniesta's dangerous cross from the left was intervened by Goal Keeper Kameni.In the next minute it was Messi who burst in to the box with great speed and skill, he placed the ball to henry who turned well but shot wide of the post. In the 14th minute Xavi beat Kameni with a great shot after being setup by a great Busquests back heel, only to be denied by crossbar. 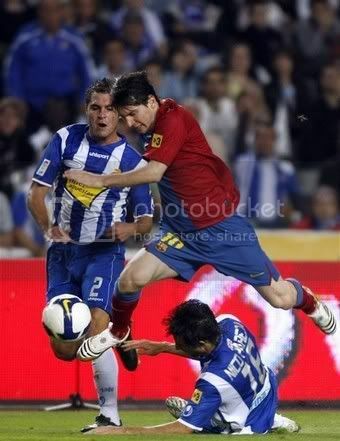 Then in the 20th minute against the run of play Espanyol scored from their first move of the match. Raul Tamudo was left unmarked by Abidal his shot was deflected and looped from Pique's body; Valdes who decided to catch the ball was fouled cleverly by Garcia and the ball fell for Coro for a easiest tappin. Valdes was booked for protesting against the goal; the truth was that it was his stupid decision to hold on to the ball in a difficult position gave the goal away. FC Barcelona's every effort from thereon was blocked by a determinant back four and kameni of Espanyol. The best chance came for Barca when Henry's shot was cleared of the line after a beautiful one tow between from Messi and alves; messi's shot was blocked by Kameni which fell to Henry who tried to smash it rather than place the ball. In the injury time of the first half Nene was sent off for a challenge on Busquests. With a one man advantage FC Barcelona started pushing forward more and more in the second half. they were occasionally caught by the counter of Espanyol players.In the 47th minute Gudjonsen heads wide from a good Xavi cross.In the 54th minute Guardiola brought Eto in for Abidal. Then brought Keita in for Gudjonsen in the 61st minute. In the 62nd minute Eto was well denied by Kameni after a great play from Henry and Xavi. In the 65th minute Bojan was brought in for Busquests. In the 68th minute shots were blocked from Henry, Iniesta and Messi by a vigilant Espanyol back four. Shortly trouble start erupting in the stadium. Some stupid Barca fans decided to throw some flares on to the Espanyol fans and then Espnayol fans reacted by getting trying to get on to the pitch. Laporta looked pretty animated and these actions of FC Barcelona fans does not make any good impression. If they are caught in Camera they should be banned for life from attending any football game. With the restart after 8 minutes; It was Bojan who shot wide in the 82nd minute. But in the 83rd minute Henry equalised with a lucky goal. Xavi released Henry with a great ball; but Kameni rushed out of his post and looked to have dealt with the ball; but Kameni's clearance hit defender Jarque and fell on to Henry for the easiest of finish.In the 88th minute Messi outrun the defense after a clever ball from Alves but his great cross was blocked by defense. Then in the last minute Messi releases Eto but the striker was brought down. The defender seemed to have got a touch on the ball. But the funny part was that the linesman seemed to have flagged for offside against Eto. 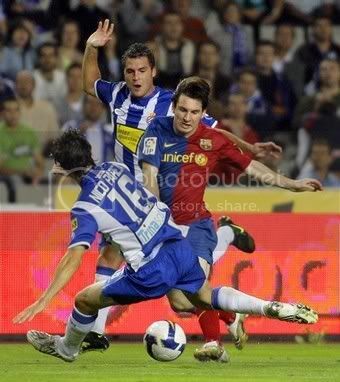 The referee discarded that call from his assistant and gave the penalty which Messi duly converted. Barca once again found it tough to break a stubborn defense. But there are some positives to take from the game. Henry for me even though who had a good game, didn't do enough to be looked ahead of Eto. Barcelona has been having the majority of possession; but they should really try hard to make these count. 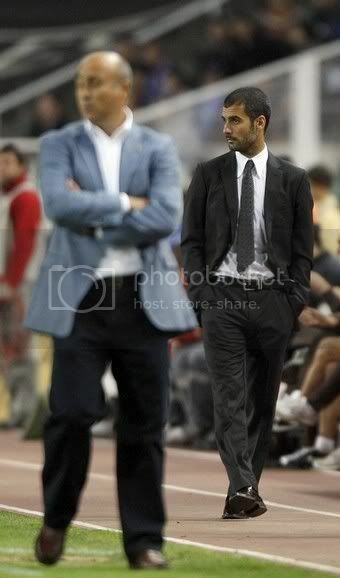 Today's derby match should be the most stern test Guardiola have to face since he has taken charge of FC Barcelona. Espanyol has been a tricky place to visit for FC Barcelona in the past few years. We not only fared badly but there were some really bad memoirs. Espanyol had a very good start to this season but have stumble off in the last two matches. Their last match at Sevilla ended at a 2-0 loss. But then that's last match; they will be a very difficult side to deal with at their home. When you take into consideration the away troubles of Barca, this could be considered as a serious test of their title credentials.FC Barcelona has been in a good run; but not without any triouble. They almost managed to threw away last match against Betis. They have to keep their concentration for longer periods if they wish to come out of this match with their head held high. Caceres was replaced by Pedro in the squad named by Guardiola. The squad consist of Valdés, Pinto, Alves, Puyol, Piqué, Márquez, Abidal, Busquets, Touré Yaya, Keita, Xavi, Gudjohnsen, Iniesta, Pedro, Bojan, Messi, Henry, Eto’o. Puyol is expected to return back to the starting eleven. But Guardiola might be tempted to give Marquez rest and chose Pique instead in this match. But then the Abidal is also a problem. But the back four may be expected to be formed by Puyol, Abidal, Pique and Alves. The midfield is expected to be made up of Toure, Busquests and Xavi. The forward line up would remain unchanged with Iniesta, Messi and Eto. Henry has spoken out against the lack of playing time; but Guardiola would be doing a world of good by keeping the front trio unchanged. They looked like have settled. FC Barcelona in the last few matches have played contrasting ways on either half of the break. In Espanyol they have to concentrate for the entire match. Any lapse in concentration would be disastrous. Barca needs to keep up their attacking instinct as when they relax they start putting huge pressure on defense and the defense crumbles. Valdes - 6.5 - Had pretty little to do apart from conceding the goal. The goals were no fault of his; but would have been dissappointed with the second goal as he got a finger tip to it. Did well to stop the Capi goal in the 58th minute. 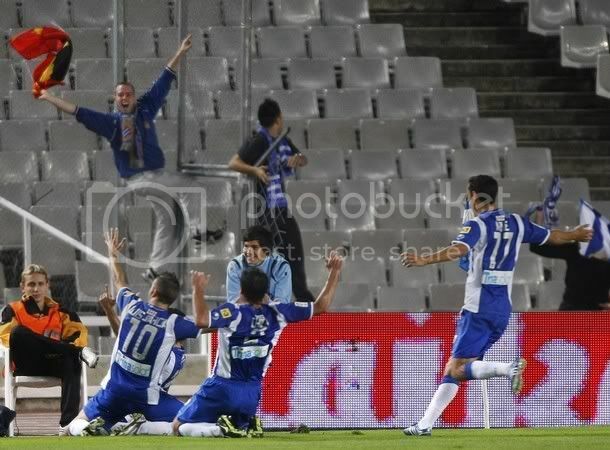 Went wild when Monzon's free kick found the back of net. I thought he was going to slap Eto and Toure. Alves - 7 - Did really well going forward. Gave away some cheap balls in second half; then that is his nature of play. Also Betis was able to find space in the left wing. But then Barca cannot complain as he is a attacking right back. Excellent cross for the third goal. In the 39th minute showcased his skill with a wonderful run into the box; his clever chip narrowly caught Castro's arm and deflected from goal. Caceres - 6 - Was the best of the two centre back. That says it all. Did well to tackle Garcia eventhough it was quite risky. Showed real promise in the first half and came intro pressure when his midfield gave away balls cheaply. Marquez -4 - Had a pathetic night. Was almost caught out in 27th minute to Enama. Was expected to rally the defense in the absence of Puyol. Did just the opposite. Abidal - 5.5 - Guardiola should look to get sylvinho in his place. He has no other option or to got to three man defense. He is a disaster and puts Iniesta out of the match for most of the time. Xavi - 6 - Had an average game. He was not at all at his best. But still made his presence. Did well on tackles. At times was sloppy with passing. Keita - 5.5- Had a pretty ordinary night. Was in the shadow of Toure for long time. The performance fell apart in the second half. Toure - 6.5 - Played in the starting eleven after some time. Was brilliant in the first half. He should have been given a rating of 8 for first half. Won almost all the tackles. But in the second half just dissappeared. Guardiola should have replaced him in the begining of second half. Messi - 8.5 - For once he started to play like a team man. Created the second goal all by himself. Had some beautiful runs. Was selfish at time but was selfish at times; but that's ok. In the final hours he was simply outstansding. Eto - 7.5 - Had a decent game. Excellent first goal and a decent finish for the second goal. Was quite for the rest of the time. Tacked back to help midfield and defense regualrly. He has not yet hit the top gear and Barca can expect great things from him once he is in full flow. Quite embarrassed by Guardiola's reaction to his celebration for the third goal. Iniesta - 8 - He had a quiet night by his standards. But was never shut down. There were some early passes to xavi and Keita. But was kept out in the second half by his own midfield. Henry will have a difficult time convincing Guardiola that he can do better than this "Little Man". Gudjonsen - 7.5 - Won the match with a clinical finish. It was a surprise for him to get playing time. But did well. Some good running were there. He should be given more time. Busquests - 7 - Was solid once he came. He was able to re-take the control of the midfield from betis and that helped Barcelona a lot. May be we will see him more as our DM this season. Bojan - 6.5 - Was trying too much to impress his boss. Had a great move after he came. Failed to convert in a one on one situation. Was quick and agile; but a bit selfish. He needs to be patient. I have not figured out a word to describe FC Barcelona's performance in yesterday's match against Real Betis. They looked like hell bound on throwing away a match which should have esily won. Once again the opposition scored goals from the only chances they had. The positives from the game has to be the return of form or let me say interest from Lionel Messi. He was very good and looked at times ready to build a move along with his team mates. The hero of last two games had a average night and Barca inability to close the encounter early can be attributed to that. Eto looks like have found his goal scoring touch. Guardiola shuffled the team completely. Puyol was given rest and Caceres joined Marquez in central defense. Alves and Abidal played in their usual position of full backs. The midfield was made up of Xavi, Keita and Toure. The forward line-up remain unchanged with Iniesta, Eto and Messi. FC Barcelona started the game very confidently. In the 4th minute Toure earned a free kick outside the box after an excellent run into the box. 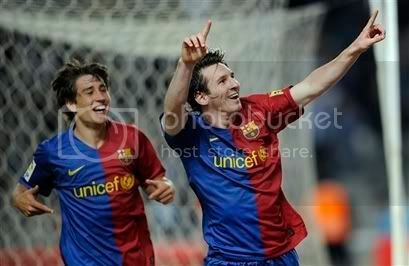 Then in the 7th minute Iniesta and Messi combined well from the left but the defense managed to clear the ball somehow. In the 12th minute Iniesta tried to reach Xavi with a great pass but was a bit heavy. 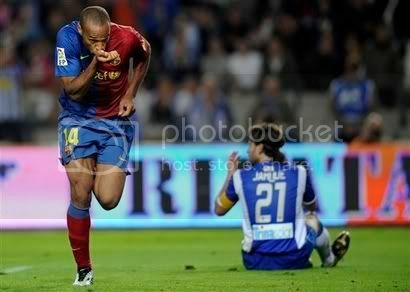 Then in the 17th minute Eto put FC Barcelona one up with an wonderful goal. Messi played the ball to Eto just outside the box, turned to the right found a bit of space thundered his shot past the Goal Keeper to the inside of cross bar. Then in the 23rd minute both these players combined well to create the second goal, Messi took on the defensers with his speed and cuts the ball back to Eto, who perform the simplest of finish to sent Barca two up. In the 27th minute Enama almost pulled one back after rounding off Marquez but shoots high. In the 30th minute Messi in his usual self twists and turns past defenders but his shot was easily blocked by Goal Keeper Casto. Then in the 32nd minute Alves's good defending saw Jose Mari's dangerous cross getting cleared. Then in the 39th minute Alves run into the box turning past defenders but his clever chip somehow got deflected off the Goal Keeper. 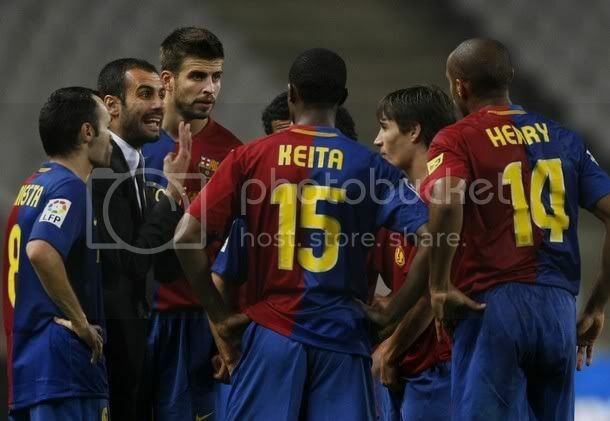 Second Half start was a repeat of Gijon match; Barca players suddenly switched off. They were not helped by the stupid decision of Guardiola to continue with Keita and Toure in Midfield. Both of these players were fasting and there was no sense in continuing with them. They looked completely tired and were losing balls very cheaply. What this did was this shut down Iniesat completely from the game. In the 57th minute Jose Mari turned past Marquez but shoots wide. It was a begining of things to come. In the 58th minute Capi's powerful shot from way outside the box was saved by Valdes. Then in the 59th minute Toure concedes a free kick on the edge of the box; Monzon's free kick went through the defensive wall. Valdes was pretty unhappy with the wall. Then in the 67th minute Jose Mari equalised for Betis after recieving an excellent ball from Sergio garcia; Valdes could get only his finger tips to the ball. Guardiola reacted immediately by bringing on Busquests and Gudjonsen for Toure and Keita and then FC Barcelona started to take control of the game back. In the 69th minute Iniesta provided an excellent pass to Xavi outside the box who was brought down. 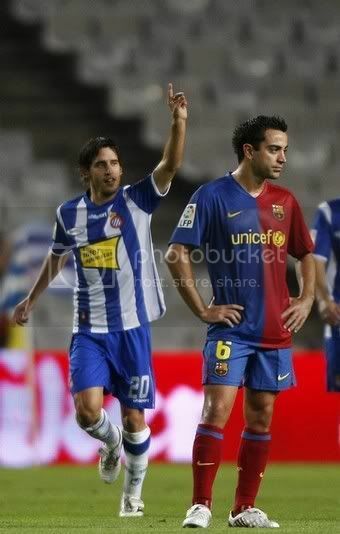 the resulting free kick from Xavi was saved by Castro. In the 77th minute Eto was replaced by Bojan. In the 79th minute Bojan's excellent shot after a great individual play was saved by Goal Keeper Castro. Then in the 80th minute Barca went one goal ahead courtesy of an excellent finish by Gudjonsen. Alves inch perfect cross from right was put in to the far post by a sliding Gudjonsen. In the 85th minute Bojan should have put Barca two up but he shot straight at the Goal Keeper after Messi played him through. In the last ten minutes Messi was controlling the game totally, Betis defense were not able to stop him. Then in the dying minutes Alves's free kick was saved by Goal Keeper. Barcelona played well and they deserve the victory. But questions would be asked about their second half performance and rightly so. They need to tighten up their game especially after a break. FC Barcelona would be hoping to carry on their last two good performance against Real betis also. After a shaky start Guardiola's boys looks like have put the train back on track. Henry who missed the 6-1 drubbing of Gijon will be back in place of Pedro. The squad announced by Guardiola for Betis encounter is Valdés, Pinto, Alves, Piqué, Márquez, Puyol, Xavi, Gudjohnsen, Iniesta, Eto'o, Abidal, Touré Yaya, Cáceres, Bojan, Keita, Messi, Henry and Sergio Busquets. Pedro should consider himself unlucky to miss out on the squad. There could be some changes especially considering the busy week. FC Barcelona will be playing Espanyol on saturday and would be heading for their Champions League encounter on Wednesday. How Guardiola is going to handle Messi would be the most interesteing part of this game. Another question everybody is asking is whether Busquests get another start? FC Barcelona is expected to retain the squad which played against Gijon. Valdes is expected to be guarded with a four man defense consisting of Puyol, Marquez, Abidal and Alves. Midfield would be made up of Keita, Busquests and Xavi. Up front Iniesta will join Eto and Messi like last match. It is difficult to expect Henry to walk into the side for this match. If that happens then Busquests can be expected to start from substitute bench. Guardiola rightly was in a cautious mood during the pre-match press conference. He warned his players and fans not to expect a repeat of Gijon performance. He has singled out Iniesta for praise during the press conference. If Barca is going to have a good night, then it is mandatory that Iniesta has a good night. Betis will be more defensively organised and could be bit hard to crack. So this could be a test of how much Barca has recovered from their initial slump in form. FC Barcelona sadly has been always about the players like Ronaldinho, Messi, Rivaldo, Ronaldo, Figo etc. Many a times we tend to overlook the contribution of many of our heroes. Andres Iniesta was in place to make that list of unsung heroes. This liliputian from Fuentealbilla has been Barcelona's best player of last season. He is inline to become the best player of this year also. But we will take his contribution for granted. As soon as Messi hits back his great stride we will forget this little man's contribution, surprisingly he will not complain about that. Usually there are two types of footballers - one with tremendous skills who tend to drift away now and then, and the other with moderate skills who tend to give their 100% percent everytime on the pitch. Iniesta belongs to the third group which does both to perfection. Iniesta was off colour when FC Barcelona lost their seasons opener to Numancia; or may be we can say that Barca lost that match because their Mr.Reliable was having a bad day. Guardiola expressed his concerns over Iniesta's performance in that match and dropped him for the next match against Racing. But when he replaced Hleb in that match he showed what FC Barcelona was lacking till then. He undoubtedly has been the man of the match in FC Barcelona's last three matches. Even when the front trio has failed repeatedly it is Iniesta's partnership with Xavi which was pivotal in last two decent performnace by Barca. Eventhough Louis Van Gaal was the one to handle Iniesta his debut; his success at the top level has to be accredited to the belief Rijkaard had in him. To an extent we can say that Iniesta was the most over abused player of the Rijkaard era. Rijkaard used him in all position - front left, front right, midfield, holding midfielder and even left back. His humility has earned him the title "El Anti-Galactico" by the Catalan press. Last match against Sporting Gijon is the prime example of the commitment he shows; he was slotted to play the attacking left front role but many a times we saw him track back and help Abidal in the defense. Because of this natureIniesta is simply the least substituted player in the Barcelona side. Iniesta along with Xavi has become the core of Spain's National side. When he first made his debut there was reports suggesting that he is pretty unlucky to fight for a place in that already crowded midfield. Nobody gave him a chance of starting for Spain in the Euro. Such was his performance in the Euro qualifying matches that he pretty soon became the second most trusted midfielder for Luis Aragones; first being his campatriot Xavi Hernandez. He displaced Cesc Fabregas from the starting eleven. That didn't go that well with the English Press; there were suggestion put to change thes system so that the three Catalan midfielder can play together. He didn't start the Euro campaign that well; he was solid but wasn't magnificient. But with every match he improved and was at his best in the last three matches. It's time the FC Barcelona fans stood up and appreciate this "Silent Hero". The more he plays the more he improves; two seasons before everyone complained about his ability to score goals. Now he is regularly getting into that scoresheet. His natural flair would be the driving force for FC Barcelona and Spain in the present and the future. With Xavi Hernandez, Andres Iniesta Lujan forms the most dangerous partnership in today's midfield.